Viking Books for Young Readers, 9780670012855, 40pp. What color is your mood? On a really good day, Jamie feels purple like the first bite of a juicy cold plum. And with a crayon in his hand, Jamie eases into a green feeling--like a dragon dancing through a jungle made of green jello. But when his brothers push him around and make fun of his drawings, Jamie feels like a dark gray storm brewing. What will it take to put Jamie back in a bright-feeling mood? Through Jamie, young readers will learn to describe how they’re feeling in a unique way. 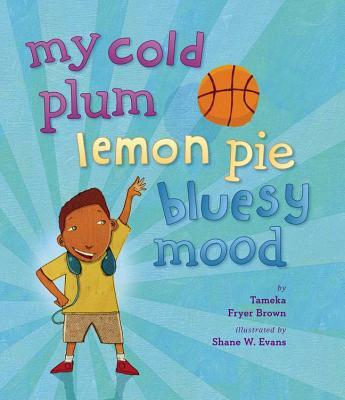 My Cold Plum Lemon Pie Bluesy Mood is a 2014 Charlotte Zolotow Honor Book. Tameka Fryer Brown loves drawing with brand-new, super-sharp crayons like Jamie, and her favorite color is all the colors of the rainbow. Writing stories for kids puts her in a sweet, juicy, peachy kind of mood. Tameka lives with her family in Charlotte, North Carolina. Shane Evans is an artist, author, illustrator, musician, songwriter, and founder of Dream Studio, a community art space in Kansas City, Missouri, where he currently resides with his wife, daughter, and three dogs. In 2012, he became a Coretta Scott King Illustrator Award winner for Underground, published by Roaring Brook Press.